After seven seasons in the Football League Championship, Middlesbrough are finally back in the Premier League. A scrappy draw at home to promotion rivals Brighton on the final day was enough to seal second place in a game that was emblematic of Boro’s season: much more difficult that it needed to be. However, despite the nerves and anxiety, they did it and the final whistle brought as much relief as it did joy. Their time out of the top flight has been a tumultuous one, but this is a club and an area fully versed in tough times. Teesside is an area built on industry, predominantly steel making after the discovery of iron ore in Eston hills, dating back to the mid-Nineteenth Century. Masterminded by businessman Henry Bolckow and John Vaughan, it saw Middlesbrough become the most famous iron making towns in the world and known as ‘Ironopolis’. As time moved on, with its founders long since passed away, Bolckow-Vaughan became part of Dorman-Long and produced its most famous landmark, the Sydney Harbour Bridge. In the 1960’s the industry was booming and became part of the nationalised British Steel, only to be decimated and privatised by Margaret Thatcher’s government in the 1980’s, creating large scale unemployment. Whilst a strong chemical industry cushioned the impact at that time, by the late 2000’s it too was hard hit and when SSI UK was liquidated late last year, meaning the closure of the last remaining Teesside blast furnace in Redcar and the end of over 160 years of steel making in the area. With a proud tradition gone and the region economically on its knees, Teesiders looked to their football team to give them a lift. A football club bringing hope to its region is easier said than done and Middlesbrough Football Club very nearly went the same way of local industry in 1986. With the club gates padlocked shut, local businessman Steve Gibson put together a consortium that saved the club from extinction and successfully paid the fee to register the club with the Football League with just 10 minutes to spare. Middlesbrough as a football club and a town truly know the meaning of hard times. As Chairman, Gibson has not only saved Middlesbrough from liquidation, but also overseen the move from Ayresome Park to the Riverside Stadium in 1994 and continued to financially back the club to this day. Promotion is potentially worth a reported £170m and propels Middlesbrough into the top 30 of Europe’s richest football clubs; such is the enormity of the Premier League’s broadcasting deals. That’s quite a contrast for a club on the brink thirty years ago. Just ten years ago, Middlesbrough were in a UEFA Cup final, losing to Sevilla, but within three years saw relegation from the Premier League and once the parachute payments had finished, faced financial hardship once more. This is where their ambitious chairman stepped in for the club he loves and what separates him from so many other club supremos. This is not a business adventure, investment opportunity or billionaire’s pet project for him; this is a passion, his boyhood club and it has never gone unnoticed amongst the Middlesbrough fan base, who hold him in the highest regard. That’s not to say he hasn’t made mistakes, after the most successful manager in the club’s history, Steve McClaren, left in 2006 to take charge of England, Gibson appointed the inexperienced Gareth Southgate as his successor and he took the club down in his third season. After him came Gordon Strachan with an influx of Scottish players and despite the money spent, couldn’t even get near the play off positions. Gibson turned next to former club captain and local hero Tony Mowbray who despite early promise, struggled to get Boro where they wanted to be under the financial constraints that were taking hold. Eventually though, they found the right man in the form of Spanish coach Aitor Karanka. Tactically smart, with links to Jose Mourinho and Real Madrid, he made some good loan signings and got more out of players already on the books to lose the play off final to Norwich in his first full season. Taking the disappointment of the play off final and using it as a motivation, Boro have been in the hunt all season. Their foundation is a tough defence and combative midfield; their mixture of pace and experience in attacking positions has been enough to see them through some rough patches of form and get them over the line. They also overcame the behind scenes row that saw Karanka step away from the club for a few days and threatened to derail their promotion push. Whatever the circumstances involved, the club will need to be fully united next campaign if they are to stay in the Premier League. They will also need to make some squad additions, where the spine of the team will realistically require upgrading. Goalkeeper Dimi Konstantopoulos is capable of making some good saves, but too error prone for a level where mistakes are more often punished. A proven centre-back will be important as Ben Gibson has found it difficult whenever Daniel Ayala, the leader of the backline, has been missing and Gibson could find the step up equally challenging. Grant Leadbitter’s experience in midfield has been vital under Karanka, but his ageing legs will be under strain in a division where Middlesbrough will not enjoy the level of possession they have in the Championship, so a central midfielder should be another on the shopping list. Finally, a striker is a must because David Nugent isn’t good enough and Jordan Rhodes is unproven at the top level. A new spine may sound harsh, but if Middlesbrough are to re-establish themselves at the top, it will be needed, as will all of Karanka’s contacts in Europe to shop smart. Leicester have provided the hope and inspiration for promoted clubs that smart scouting and coaching can bring success, Middlesbrough have to follow that model. If they do, then maybe a rejuvenated Middlesbrough can lift Teesside from its knees and into a brighter future. Karanka will look to add experienced replacements but not for 1st team at least initially. Agree re lead bitter, been awesome but we need more pace in that area alongside clayton. LB will still play at least 20 games next season I suspect. 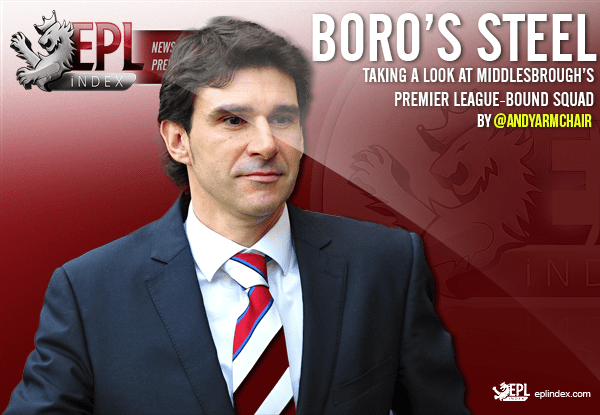 Categories: EPL Index Featured Article, EPL Team Analysis, and Middlesbrough.' 'Tags: Aitor Karanka, Boro, Championship, english Premier league, Karanka, Middlesborough, and Steve Gibson.